LEN - www.lankaenews.com | Govt. in peril again ! 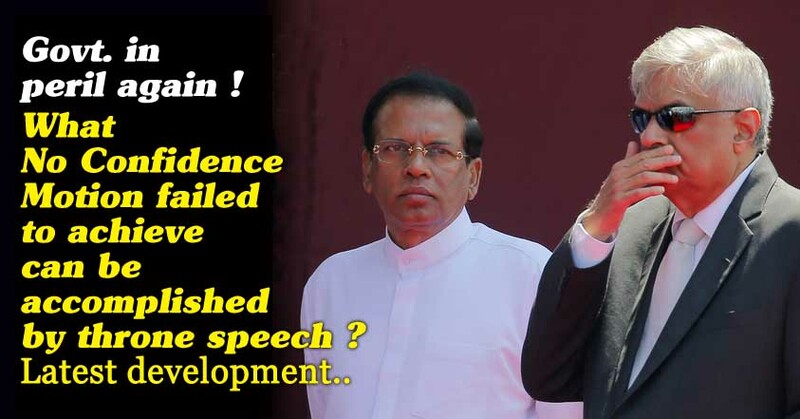 What no confidence motion failed to achieve can be accomplished by throne speech ? Latest development..
(Lanka-e-News - 20.April.2018, 6.55AM) After having failed in the recent no confidence motion brought against Prime Minister (P.M.) Ranil Wickremesinghe , another conspiracy is being hatched to change the UNF government on the 8 th of May via the throne speech when the new parliament resumes sessions after the prorogation , based on reports reaching Lanka e news inside information division. When the new Parliamentary session is being convened , the head of the State has the opportunity to make a policy statement incorporating the government’s balance programs , which is called the throne speech. The opposition can if necessary based on the throne speech ask for a voting in parliament, in which case the speaker will have to grant that request. Under those circumstances if the throne speech is defeated , the government will terminate , and a new government will have to be appointed. Under the old laws , if the throne speech is defeated , a Parliamentary election will have to be held . But following the 19 th amendment , a period of 4 1/ 2 years have to elapse , and in case the throne speech is defeated , the victors can under a new prime minister form a new cabinet , and appoint a new government . In other words , a situation similar to what prevailed on the 4 th April during the no confidence motion against the P.M. can come into being again on the 8 th of May. According to Parliamentary practice , the throne speech has to be made by president Pallewatte Gamarala as the head of the state . Based on reports reaching Lanka e news inside information division , president Pallewatte Gamarala when proroguing parliament and fixing the next parliament session as 8 th of May , has not discussed that with the cabinet led by the P.M. They have come to know about it only after the gazette notification was issued by the president. Gamarala prior to that threatened the UNF including the P.M. that if he is going he would not just go , and will only go after setting fire . It has by now come to light the prorogation of parliament and convening new sessions is based on a legal ‘trump card ’ wielded by the president , and information about those individuals who helped him in that direction has also now surfaced. The president who has to make the throne speech on the 8 th of May has not exchanged views so far with the cabinet including the P.M. There is no law anywhere whereby the president can alone make the policy statement about the remainder programs without the cabinet and P.M. (That is, the president can make an obnoxious throne speech which even the UNF cannot approve of. Yet , if the government is to be safeguarded , the UNF is bound to vote for it. In any event the minority parties which voted to rescue the government might not vote on this occasion. In that case there is a likelihood of the government collapsing). However , if necessary the parliament can convene its new session without a throne speech for which the president should agree. The chiefs of the UNF government have given serious consideration to the latest development and the perilous unstable situation it is learnt , at the time of writing this article.